The Ultimate Wintery Nuts | I made that! My head just exploded with happiness over your combination of bacon and candied nuts! 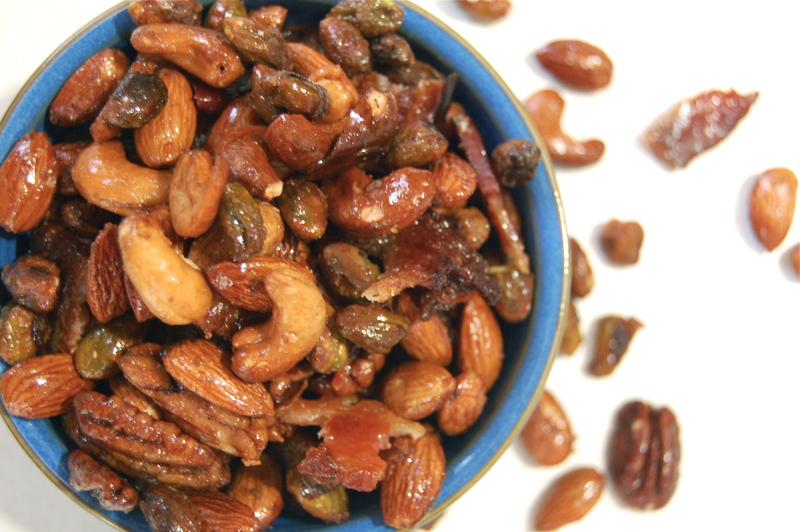 What a sweet-salty, protein-filled snack! I can’t wait to try it. What will the name of your culinary adventure be? Is it a kitchen studio, where people can take classes? A series of workshops that provide cured meats and pickles for Delancey? If I want to learn more about learning to make cheese at this place, do I look for updates on this blog or another place? So excited for you! Thanks for sharing your stories and recipes. What Kate said. 🙂 Seriously, I am very interested in learning more about your new offerings. I haven’t found a place where I like to take cooking classes yet (I did like the very hands-on nature of the one Culinary Communion class I took) and this sounds like it might fit the bill. I recommend following us on facebook. When we have a website with all the details, that’s where we’ll announce it. Thank you for your interest, I hope I meet you in kitchen this spring! Congrats!! That is fantastic news. I love Delancy, although I have only had the opportunity to go one time. Looking forward to hearing more about you progress and hopefully taking a class (and seeing that beautiful table) in the future! Congratulations! I wish I lived close by so I could visit! I ‘ve never comented before but just wanted to tell you that I read your blog all the time and have made several of your recipes, everything is just wonderful! Best of luck in all you do! we are HUGE HUGE delancey fans here in our house and this announcement makes me so excited. I hope you guys make quick progress so i can enjoy all the yumminess so so soon. Congratulations. As one of your readers that isn’t in town, I’m sad I won’t be able to visit this new venture, but best of luck. Oh my, way too delicious for words. Congratulations on the kitchen, it sounds like a fantastic idea. I wish there was something like that around me, I would want to be there all the time learning and absorbing. Wonderful! The nuts themselves will last for a couple of weeks. 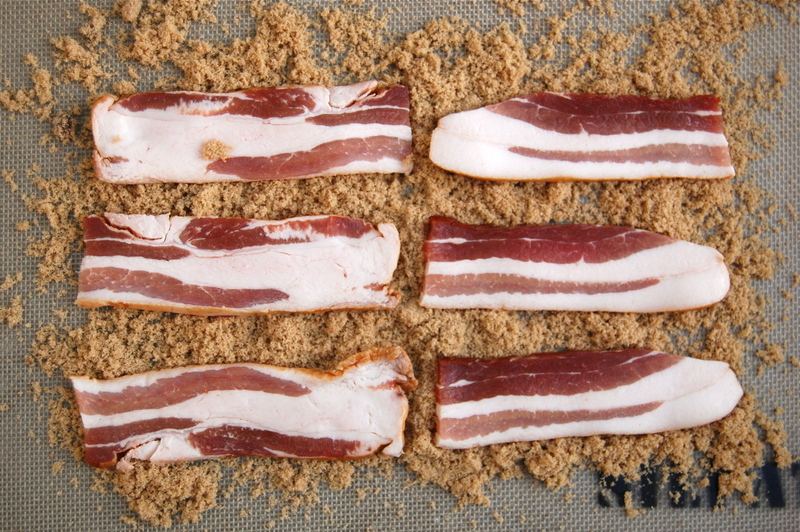 The bacon though, I would only use that if they’re going to eaten in the next 12 hours. Yeah, I thought that’d be the case. Still, I’m sure the nuts would still be super delicious on their own. You have taken my two favorite appetizers and combined them into one sinfully delicious snack. I am making these this weekend. Thanks for the recipe! We also share the same DREAM JOB!!! I want to do the exact same thing in San Diego, Ca. Congrats!!! Can’t wait to see the amazing stuff you guys come up with. This looks great but I have a question. I have a chestnut tree in my yard and I’ve been picking up these little things for a week now and I don’t have a clue what to do with them. Do you have any suggestions? That is SO cool! Just liked you on Facebook and can’t wait to read about developments. And, yum, I love nuts! Yum and awesome. Wished I lived in a different city. Oh wow…great looking recipe and The Pantry and Delancey sounds super cool! 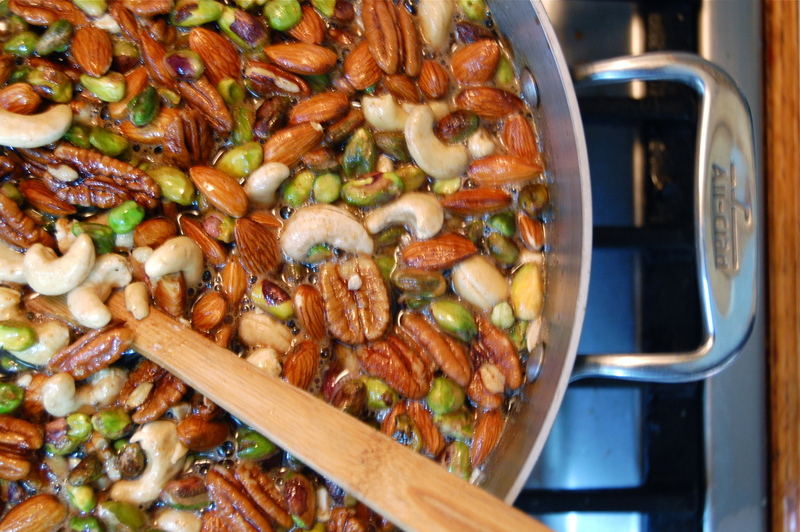 I made these nuts (without the bacon because I will giving them to someone who keeps kosher) this afternoon. I cannot stop eating them. Excellent recipe and quite simple to prepare. I would advise to watch closely while they are roasting. Mine were done in 11 minutes…a few more seconds and the pistachios would have burned. Thanks so much for a fabulous recipe and a great site. Hi Brandi – I met you last Friday (knitting) and I’ve just checked out your blog, congratulations on your new adventure! I’m excited to follow along on your new project and try some of the ideas from your blog. Hope to see you in the future and hear how things are coming along! Hi! Thanks for checking my site out! Hopefully Merriss will throw another knitting party soon and I’ll see you there. Deadline for entry is this friday! what a wonderful opportunity to be so very creative & share with the community! I’m so excited for you and your new biz. I don’t live in Seattle, used to live in PT, but from what i see on your blog it is going to be a big success. keep us posted online it is so inspirational on all fronts! I wish I still lived in Seattle so I could take advantage of those classes. 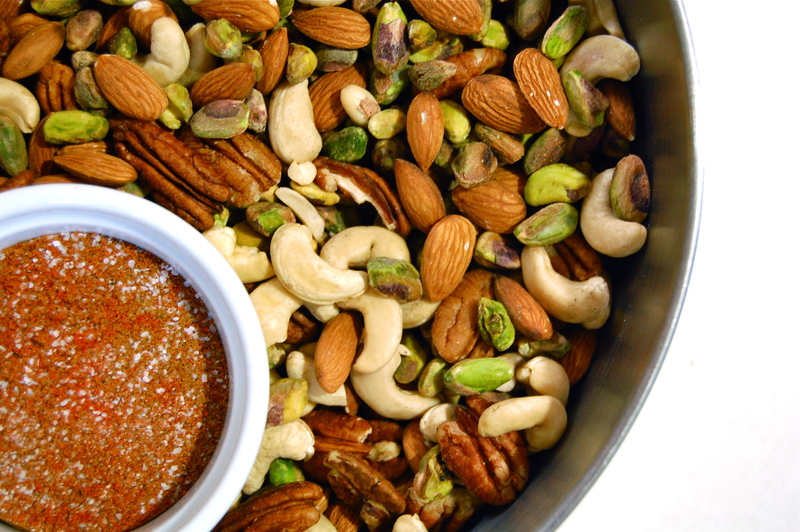 Those nuts look awesome, I will have to give them a try for the holidays! 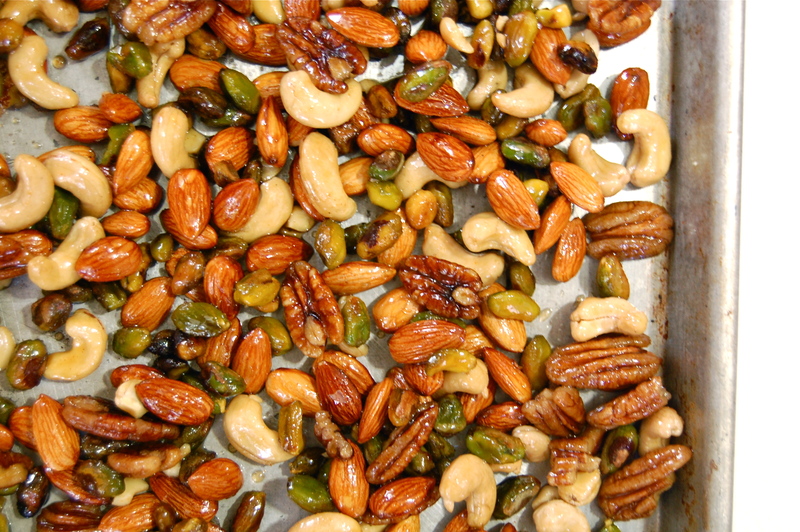 These nuts are so very delicious – I made a batch today and think I will give away jars for Christmas presents. I do have a question though – I live in Houston and it is very humid here. Is there a way to “dry” them out some so they don’t stick together? I can’t really cook them any more as they would burn. Any suggestions? I’m so glad you like them! Try roasting them at a lower temperature. That should allow you to cook them longer and get them a bit drier. made this, ate this! so delicious. I’m a big fan of the nuts, but the bacon is where the money is. Who knew anything in the world could be so overwhelmingly delightful? My (vegetarian) aunties demand more, and I now dream vividly about ice cream with a caramel sauce made from the bacon drippings. 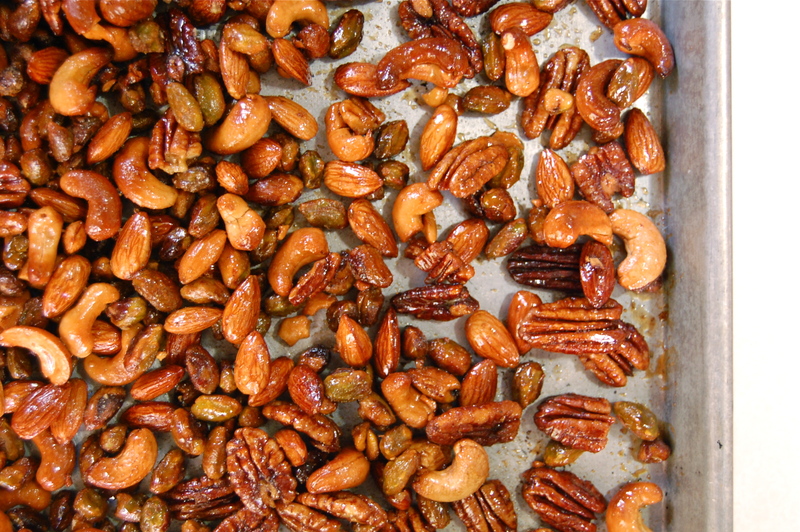 Spiced nuts with candied bacon sounds like quite a treat! Thanks so much for this recipe! It is fantastic! I’ve made it 4 times already. Three batches for gifts and one batch just for my husband because I couldn’t get the bowl out of his hands! I might be late to the party, but oh my freakin’ dog…that looks so good. You had me at “wintertime crack”. It’s -21C here today, and this was just what I needed to warm home and hearts. And the bacon? Brilliant! I am salivating already. Your pantry ideas sounds a-may-zing! I wish I lived in Seattle to experience it- love the family-style dinners where people can connect over tasty treats. Just awesome to read your recipes and see the photos! These nuts make me hungry early in the morning! Some day looking forward to coming to Seattle to see all that you are doing! I just made these a couple of days ago, and they were well-liked at two different pot-lucks. I used roasted, unsalted nuts, and I’m not certain if that was the cause of this, but they did not take the full roasting time to get brown. I guess I was kind of nervous, having never candied anything before, that if I didn’t roast them the full time they would be really sticky, but I pulled them out a little early and when they cooled, they were pretty much fine. 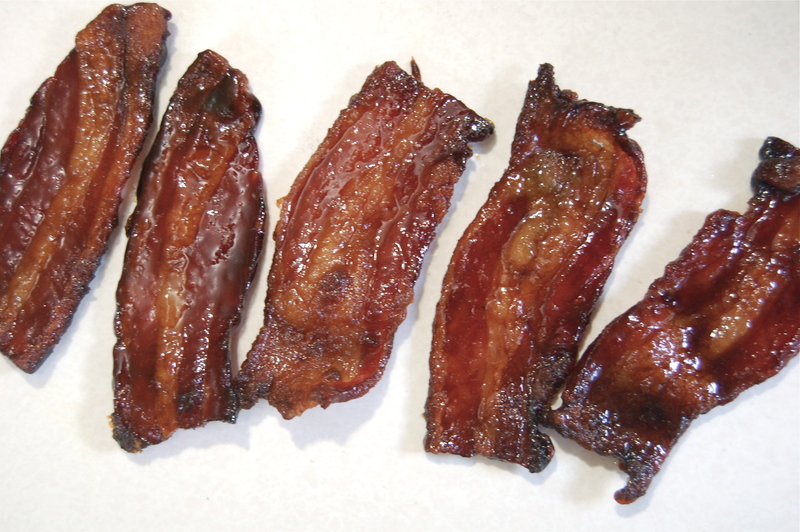 I refrigerated them, and felt like that helped keep them loose and also take away a little of the greasy feel my bacon gave them. Yum-o!